The Elektron Digitakt sampler/drum computer may have been sitting silently under glass at last month’s NAMM trade show. But no matter: it was still the gear generating the most buzz. The thing is, we’re already hearing enough about the Digitakt to pique our interest. First, there’s that price — US$/€650. That’s terrifically affordable by Elektron standards. And then there’s the compact size, the accessible-looking controls and OLED, and the focus on sequencing and sampling. This just looks like a fun, friendly groove box. 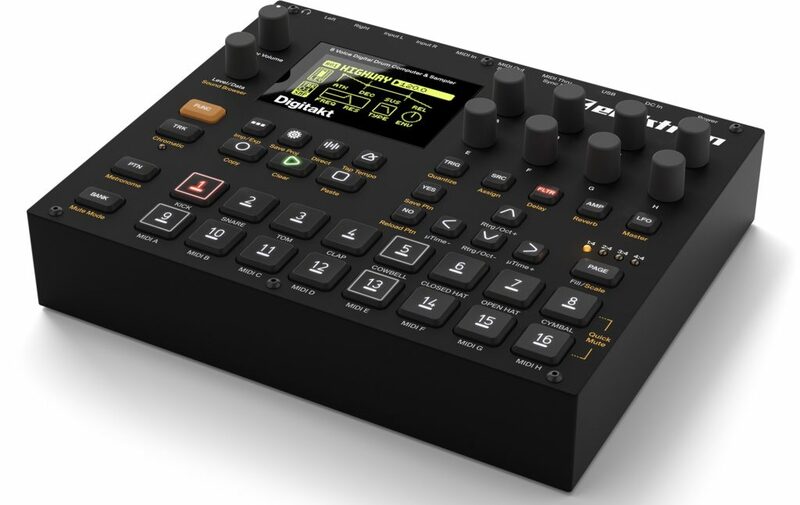 It also looks like a device that could significantly expand the audience for Elektron gear, not only because of the lower price, but because of the design. And that means you should possibly ignore some of the naysayers who are unhappy this isn’t quite an Octatrack II. I made the comparison to the Octatrack just because this is a box that can sequence outboard MIDI gear and by doing so replace a computer rig (or significantly augment it). I talked a bit more to Elektron to try to get some clarification, and here are some takeaways — at least while we keep waiting. It should make crazy sequences. Combine Trig Conditions and Retrigs with per-track track length, and you should be able to produce some wild polyrhythms and asymmetrical rhythmic goodness. Trig conditions are really part of what make this distinct from other offerings – and the blandness of looping regular patterns. It sequences external MIDI gear. This was a big omission from the Analog line, and crucial to those of us who want Elektron devices as hubs of other instruments. The Digitakt seems to be all about simple, accessible sequencing both of internal sounds and external goodies. Elektron are mum for now on more details of the MIDI tracks and how they work, but… we’ll be watching for that detail. It actually has a ton of space for sampling. So, a bunch of people got hung up on the 64MB sample storage. In fact, each project has 64MB of space into which you can sample (and sample external audio – this is a proper sampler). That may not sound like a lot, but remember, this is a drum machine, not a multisampling instrument. That’s over twelve and a half minutes of sample storage per project, at full-quality mono 44.1kHz/16-bit. Even with long one-shots, that’s way more than you’ll ever want. It is a drum machine, after all. And it does audio tracks. Now, if you want to load backing tracks and the like, there are audio tracks, too – and 1GB of project storage. It’s all about being quick and dirty. I love Elektron, I do. But for some of us, their high end devices actually do too much – resulting in a higher price, but also in more menu diving. The Digitakt seems to be the antithesis of that approach. For instance, Elektron confirms there’s no song mode. But… that simplicity is actually appealing, especially looking at that front panel. Of course, there are many things this clearly isn’t. It isn’t a mixer / effects unit in the way the Octatrack is. And we’ve yet to see how much flexibility you get with samples, with audio tracks, and with MIDI tracks. But it’s promising nonetheless.